My name is Mabel and I am a Senior Education Consultant at Britannia StudyLink. Up until the end of sixth form, I was educated in Hong Kong at the Diocesan Girls’ School. I then opted to go to the United States to pursue a politics degree at the University of Michigan. I have always had a passion for education, and therefore I found these experiences to be, in their own unique way, truly life-changing and inspiring. With my long-standing ambition to become a lecturer, I had long set my sights on embarking on Phd research studies. 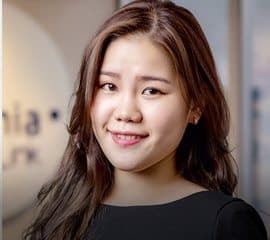 Before starting my postgraduate studies, I had wanted to gain some work experience in the field of education, and the moment I walked through Britannia’s door and met the team, I knew immediately that it would be difficult to continue my studies. I started at Britannia as part of a work placement initiative, and I have never looked back. It has been a very pleasant journey at Britannia and my hunch was right – it is an exciting start up and the best is yet to come. With knowledge of my background, many parents put the question to me – do we choose the USA or the UK for our child? It depends on whether it is secondary or higher education in question. For university, my answer is the USA all day long. Some of the best universities in the world are in the States; in fact, for business and IT fields, US institutions are in a league of their own. For secondary education, however, I must favour the UK boarding school system. The benefits of an overseas education are endless. With much smaller class sizes and more flexible curricula which boast breadth and depth, students do benefit from an academic standpoint. Students also benefit from engaging with students from all over the world, learning to accept different views and beliefs along the way. The soft skills which are developed as a result of communicating and working with one another are all valuable for the rest of the students’ lives. I remember, vividly, the first school I visited in the UK, Leys in Cambridge. I was amazed at the quality of pastoral care and extra-curricular provision. At Britannia, we do see a lot and we know when we are in the presence of something very special. When I stopped to listen to students moving around the school to go to their next lessons, I was blown away by how polite and well-mannered they were. Similar experiences followed at Tonbridge, Ashford and Rugby – the list is endless. Sometimes, people (including myself) forget what is important in education; it is not all about grades and results, it is the culture and quality of each human being. I find British Boarding school students and graduates to be extremely refined and enlightening, as well as being excellent conversationalists. Sport, music, language learning, travelling to far-off destinations and conversing with people from around the world are all fundamental elements of a “true British education”. I am thrilled to be engaged in this very rewarding line of work.